Not quite the same as this related question but similar. According to the related question, it is true that Buffett himself did indeed pay a lower tax rate than his secretary in the year quoted (his secretary being the proxy in the particular example of "middle class"). However, in a discussion I was having over on Politics SE, I was linked to this article, which shows (or appears to show) that, in this respect, the relationship between Buffett and his secretary was an outlier in terms of the relative tax burden of the rich and middle-class, and, in general, the rich do indeed pay the most tax as percentage of income, and furthermore, among the rich, the top 1% pay the most-most tax. What I want to know is, how much factual basis does the "Buffett Rule" have? Is it actually true that the rich pay a lower tax rate than the middle class, as Buffett stated, or is Buffett and his secretary simply an outlier of a system which is otherwise working properly? This is highly contentious depending which taxes (and benefits) are included. The wiki page only includes federal income tax offset by ("in-kind benefits from social insurance and other government assistance programs") from a CBO report fig 3 (nominal tax) vs fig 6 (offset by benefits). And they find a huge gap, with the lowest bracket having a negative effective federal tax after benefits are subtracted. In other words, a person in the top 0.001 percent income bracket -- who would have an adjusted gross income of at least $62,000,000 -- pays the nearly same effective tax rate as somebody in the top 20 percent bracket who makes $85,000 in adjusted gross income. That's not how federal income taxes were, at least originally, designed to work. The super-rich pay a relatively low rate for a variety of reasons. They benefit from a whole host of deductions -- like the mortgage on a yacht, for instance -- and other tax benefits that many people don't qualify for. Chief among these is the lower tax rate on capital gains -- think investment income. That maxes out at about 24 percent when you factor in a Medicare surtax that applies to some investment income. But wages are taxed at a top rate of 39.6 percent. Since many of the super-rich get most of their earnings from investments, they disproportionately reap the benefits of that lower capital gains tax rate. In the year this data was compiled, 2012, the top capital gains rate was lower still, at 15 percent. Taxpayers at the very top of the income distribution, the top 0.1 percent (with AGIs over $2.14 million), paid an even higher average tax rate, of 27.7 percent. And taxes were slashed by Trump in 2017 with "pass-through" companies supposedly mostly benefiting the rich. Individuals in the bottom 80 percent earn virtually no pass-through income. Moreover, those with higher incomes tend to receive a much greater share of their income from business compared to those with lower incomes, as the top 1 percent only earn about 11 percent of wage and salary income. Thus, any reductions cuts in the tax rate on pass-through businesses would largely benefit high-income taxpayers. The new law lowers the top individual rate to 37 percent from 39.6 percent. With the new 20 percent deduction, pass-through owners taxed at the top rate can now get their rates as low as 29.6 percent. The law starts phasing out the pass-through deduction once the net income of an owner in one of those professional fields hits $157,500, or $315,000 for joint filers. Once their income hits $207,500 -- $415,000 for joint filers -- the deduction disappears altogether. So the calculations would change again. I haven't found an updated version considering this. In that March 2018 Bloomberg piece, various experts were chiming in how easy it would be for the rich to [ab]use the new law. [Proposed] regulations accompanying the new law have only been recently announced as of Aug, 2018, which probably explains some uncertainty of their impact. So it's difficult to answer this question in general, without fixing a year or deciding who is the "rich". 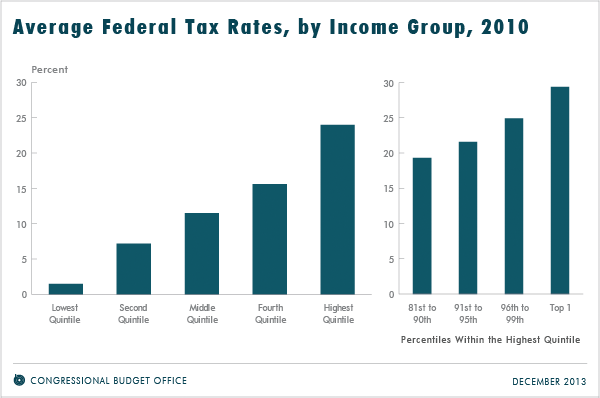 In this, we can see that the average federal tax rate paid by the top quintile is higher than that paid by the lower quintiles. And we can see that the rates for the top 1% are more than those of the remainders of the top 5%, top 10%, and top 20%. 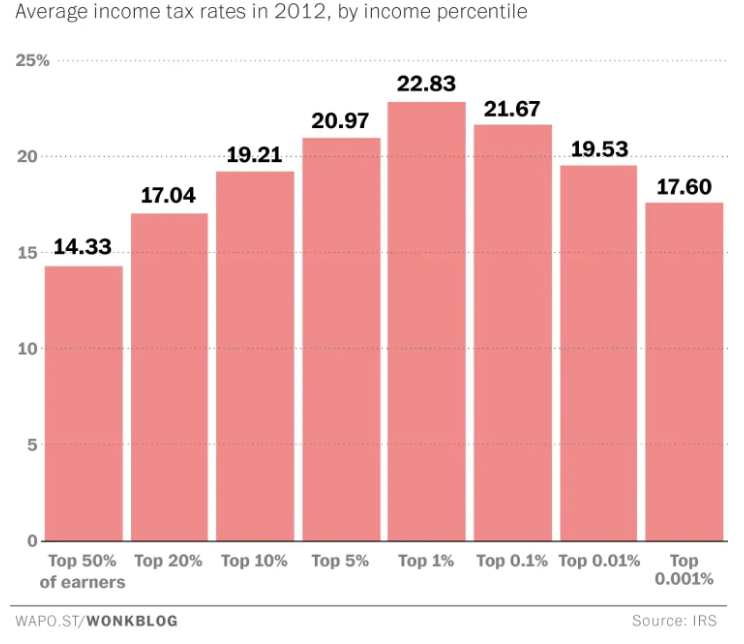 In general, the top 1% and the remainder of the top 5% pay a higher rate than the top 20% (including them). Another issue is that Buffett's "income" is almost entirely investment income, which we calculate quite weirdly. With investment income, we tax what are called capital gains or dividends. But we already taxed the money that was invested. And we tax the nominal value of the gain rather than the real (inflation-adjusted) value. This is called inflationary gains. See here. Someone like Warren Buffett will have a lot of investment income and very little salary income. Meanwhile, his secretary has only salary income. So he pays a lot of tax on inflationary gains and she pays very little. From the link, the rate he pays on his real investment gains is 29% even if his rate on the nominal gain is 20%. 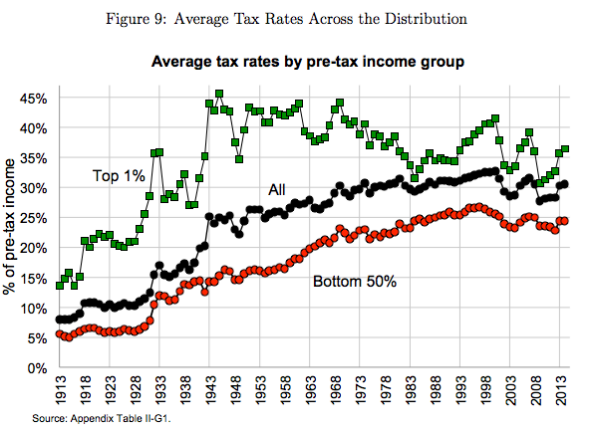 It's worth noting that when the graph was made, the top tax rate on capital gains was 15% but the inflationary gains link calculates based on the current 20% top rate. Not the answer you're looking for? Browse other questions tagged united-states politics economics taxes .